Monks in the West II / 2006 - The electronic sign at the Minneapolis-St Paul airport was flashing “Orange Alert” as a dozen Buddhist monks arrived in their burnt orange robes from around the country. They were on their way to Saint John’s Abbey in Collegeville Minnesota for three days of dialogue on celibacy with a similar number of Catholic monastics. The "Why" of Catholic Monastic Celibacy - Why do Catholic monks practice celibacy? This is an important question that all too often monks have not been very good at answering. Why? In part, it is because the vast majority of us are not only reluctant to talk about matters of sexuality in general but of our experience of living celibacy in particular. - Rev. Heng Sure, Ph.D., / Fr. James Wiseman, OSB - These two presentations on death and dying constituted the "public event" of the Second Monks in the West Conference held at Saint John's Abbey in Collegeville, Minnesota, October 26-29, 2006. Audio in MP3 - Audio recordings from the Monks in the West II gathering at St. John's Abbey. 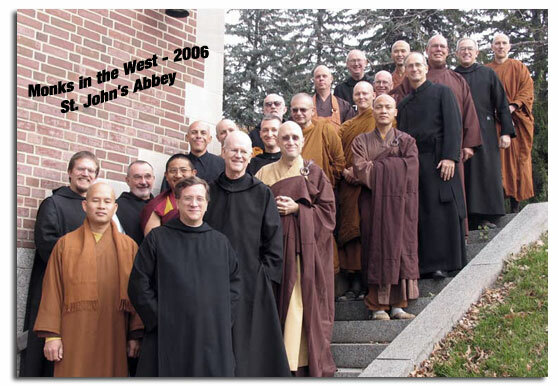 Monks in the West / 2004 - Our first day of dialogue was devoted to listening to the spiritual autobiography of each participant, and was characterized by a frankness that was both striking and refreshing. Each monk spoke of what drew him to – and keeps him faithful to – the monastic way of life. A list of possible topics for discussion, drawn up by the planning committee, suggested areas that might be explored. An Inter-religious Walking Pilgrimage - Father William Skudlarek, a Benedictine monk from Saint John’s Abbey in Collegeville, Minnesota and Jotipalo Bhikkhu, a Buddhist monk from Abhayagiri Monastery did an interfaith walking pilgrimage in July, 2007. St. John's Abbey / Collegeville, Minnesota - St. John's Abbey in Collegeville, Minnesota is a Benedictine monastery affiliated with the American Cassinese Congregation. The Abbey was established following the arrival in the area of monks from the Saint Vincent Abbey in Latrobe, Pennsylvania in 1856. Saint John's is the second-largest Benedictine abbey in the Western Hemisphere, with 164 professed monks. John Klassen, OSB, currently serves as abbot. Nuns in the West / 2005 - "It was a dance." Thus did one participant describe the dialogue experience that occurred at Nuns in the West II. Christian, Buddhist and Hindu, they came and listened and shared. The hope that we could go deeper this time was not disappointed. Nuns in the West / 2003 - The process was first the background and practice of each participant shared liesurely, then a gathering of issues, concerns, themes and hot topics. We clustered them into three themes: l) inner life of training, 2) balance of inner contemplative work and outer social engagement and 3) community and role of authority, authenticity and what's in common about the monastic way of life. Benedict's Dharma II - Forty Episcopalian men and women from around the country gathered for this very special "Benedictine Experience" inspired by the book, "Benedict's Dharma," in historic New Harmony, Indiana. MID / Monastic Interreligious Dialogue - Monastic Interreligious Dialogue (MID) is an organization of Benedictine and Trappist monks and nuns committed to fostering interreligious and intermonastic dialogue at the level of spiritual practice and experience between North American Catholic monastic women and men and contemplative practitioners of diverse religious traditions. Los Angeles / Buddhist Catholic Dialogue - Buddhists and Christians have lived among each other from the early years of Christianity. Small communities of Christians existed in India, possibly as early as the first century C.E., and certainly by the 7th century, at which time there was also a Christian community in China, but records of dialogues between these communities have not come to light.